Ben Sergent V's application and game development blog. Any and all mobile applications I've created. Wallet and API for virtual currencies. Games designed, programmed, and released by me. 2D MMORPG based upon mining, crafting, trading, exploring, and fighting with early 1900s technology. 2D mining game meant to prototype ore generation in Coal-ition. Singleplayer console game of laying siege to a castle owned by the player who last won. Launcher for most of my games. Handles logins and allows for easy updating. Multiplayer tank arcade game originally made for Chip. Virtual rendition of Stratego. Served to learn networking. Never finished game mechanics and moved on. Click as many times as possible in fifteen seconds. High scores are posted online. First-person mining game, futuristic equipment, fully editable terrain, factions and multiplayer. Modifications and plugins created for other games. Minecraft Bukkit plugin that replaces text-based mail with physical mailboxes and letters. Most popular plugin. Minecraft Bukkit plugin adding nutrition and cooking. Minecraft Modpack for use on a private Minecraft Forge server. Minecraft Bukkit plugin allowing players to craft waypoints and navigate back to those positions via compass at any time. First Minecraft mod. Added obsidian tools and a few other items. First popular Minecraft mod (10,000+ views). Let the user pick the desired painting from a GUI instead of repeatedly replacing it. Another Minecraft mod that added support for external language packs. Another Minecraft mod that enhanced the tooptip for map items. Tools and editors created for people to use. Minecraft book editor. Most popular project. 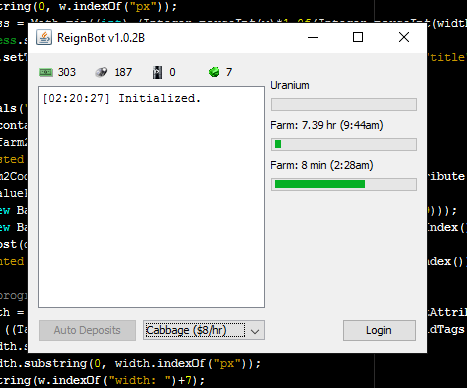 Bot to automatically harvest crops for Reign.ws game. Minecraft map-item editor. Simple paint program. First real project. Websites I've created or overhauled. Overhaul to my father's website implementing a completely new look, a custom web cart, and more. A second version of the initial Revise Library with a built-in book editor to replace Revise. Website for Minecraft books created in Revise to be shared on. Most used database project. Medium for comparing schedules with other students. First major database project. Very little use (like 10 students). Arduino Simon Game. Created for my girlfriend for Christmas. Custom gaming tokens. Created to play DnD. Duct tape wallet. Created for my girlfriend. Mostly custom design. Cheap board, cards, and game pieces for Settlers of Catan. Made to try the game before actually paying for it.